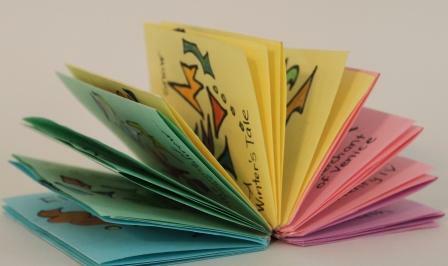 This is the simplest way I know of to make a satisfying little book with the least amount of fuss and bother. 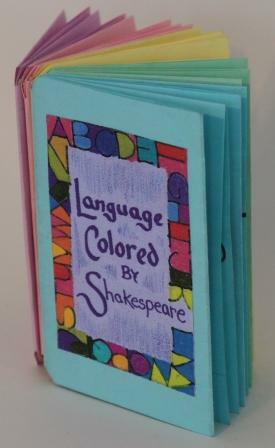 This 40-page book is 4 1/4″ tall x 2 3/4″ wide. Not big, but big enough. 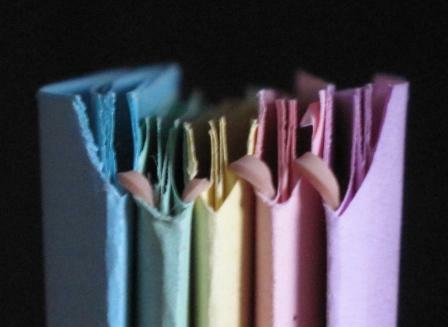 For this book I used five pieces of regular copy paper (20lb, 8 1/2″ x 11″) in pastel shades. The only other materials needed for this construction is a pair of scissors and 4 rubber bands. The size of the rubber bands does make a difference. The best size to use for this size (height) is the #16, which is two and a half inches long and one-eighth of an inch wide. I buy these at Staples: a big bag costs about $2. The steps are straight forward. 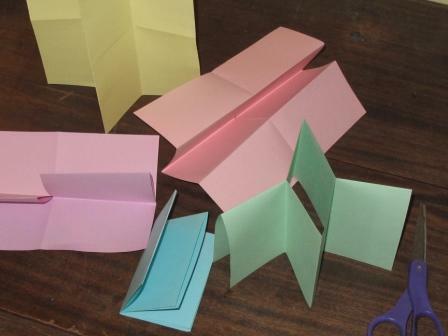 Make five origami pamphlets, as per directions in the previous post, snip away just a bit of the corner on the top and bottom of the spine of each section, then join the last page of one section to the first page of the next by putting the two sections next to each other and wrapping a rubber band around the sections to join them. It’s like making a ponytail with the two pages. Continue doing this until all the sections are together. For the book pictured here I used five sections, but there is nothing magical about this number. Any number of sections will work, thus making this a great way of making a book that has an, as yet, undetermined amount of content. There is one down-side to this structure: after about three years the rubber bands will rot and the book will come apart. It is easy enough, however, to exchange the old rubber bands with fresh ones. If, in the meantime, you have learned how to sew sections together, don’t sew these sections together: if you have used typical copy paper the grain of the paper in this book will, mostly likely, be going the wrong way for proper sewing. I finally organized my quilt of top sites on my MAC Safari browser….so when I open up Safari Top Sites, Paula, to get easy access to my favorite sites, there a thumbnail of your blog sits, changing its face with your every post. Makes me feel closer…..like a glove left behind. Hmmm, that that thumbnail features sounds like a good reason to consider MAC….Thanks. 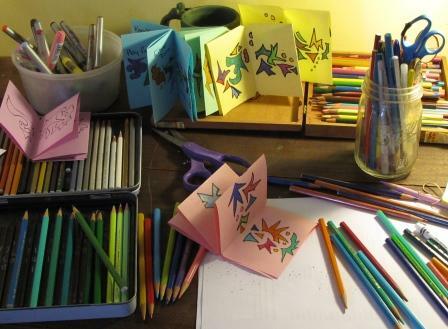 Maybe Time to Put Away the Rest of the Holiday Cards?